Small yet high performance, water pumps and fluid handling equipment, systems and accessories for the Floor care, Industrial, Marine, and Recreational Vehicle industries have been manufactured by SHURflo since 1968. Originally based out of Southern California, SHURflo now globally distributes products through a network of original and well established equipment manufacturers. 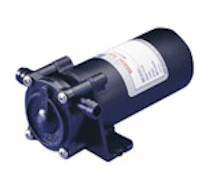 Below a selection of SHURflo water pumps are provided for exploration to best accommodate your needs. 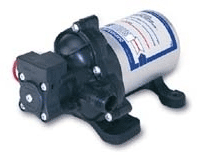 Shurflo 12 Volt Aqua King Standard Fresh Water Pump has multi-fixture installation making it easier to apply to your needs. General water transfer is possible with this pump as well as utilization with pressurize water systems within cabins. All of this comes backed by a 1 year limited warranty. It's duty is continuous and it's livewell/washdown applications are rugged. It handles hostile environments with ease. 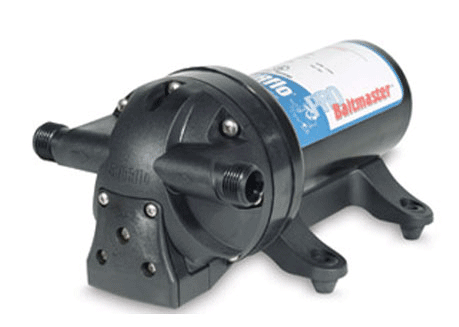 Wrapped with a waterproof ShurCote coating, the Baitmaster acquires splashed liquid immunity, and is capable of withstanding adverse conditions that would otherwise turn pumps to scrap. The SHURflo Extreme Series Smart Sensor 5.7 Pump is intelligent, using a a micro-processor sensor, it controls variable speed enabling it to silently deliver 5.7 (GPM) gallons per minute and up to 65 psi pressure that brings convenience more reminiscent of home. The pressure switch is eliminated since the sensor ALSO monitor's your system's water pressure and accordingly adjusts the speed of the motor. 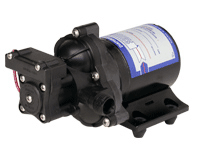 The SHURflo Multi-Fixture Demand Water Pump has a magnet motor that is permanent, heavy-duty, and responsible for low current consumption. Minimal sound is generated since the drive is made with a double ball bearing system. New Snap action switch is low profile and easy to install. 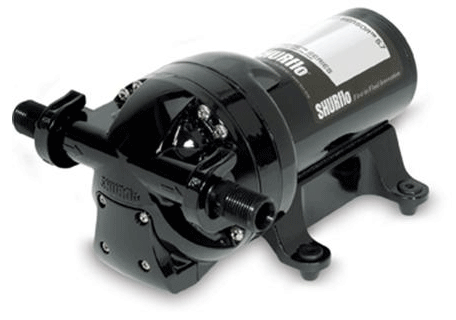 SHURflo Nautilus Single Station Water Pump is designed with the single fixture RV in mind. With 1 GPM amp draw is minimal at only 2.5 amps. Thermally protected are the 3/8" barb components ensuring that no heat damage occurs. 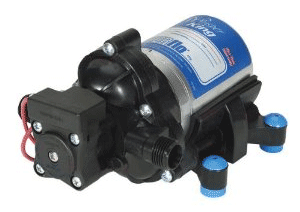 Designed for multiple water outlets is the SHURflo Water Pump 115V and Shurflo Water Pump 12V 2.8 GPM. It has three dependable independent pumping chambers allowing water to be simultaneously pumped and distributed throughout your coach. Friction and wearing is reduced since the pump's unique design keeps moving components from traveling beyond 1/8". Before shipment every pump is tested to ensure quality. SHURflo Whisper King Fresh Water Pump pushes out 2.0 gallons per minute while remaining the quietest pump on the market! 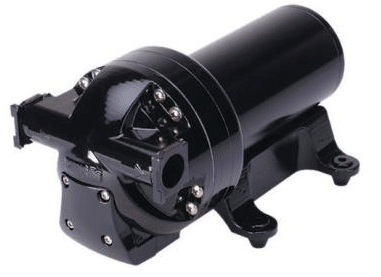 Longevity and performance are assured with the permanent low RPM magnet motor and pump head. With features like these it easily meets the prime standards of the RV industry. The Whisper King Fresh is mountable in any position. 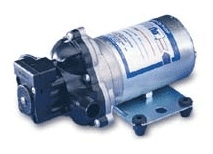 Specifically designed for the mid-sized RV, this variable speed pump is controlled by a microprocessor which enables a silent delivery of 4.0 GPM up to 50 psi. Features includes a high flow 4 chambered design, valve passages that are extra large, and variable speed with no cycling. Showers are more enjoyable, dual-fixture flow is impressive, and a performance that is ultra-quiet. Copyright © 2011 Shurflo Water Pump. All rights reserved.